»House, Garden and Dogs»And they call the wind — Annoying. And they call the wind — Annoying. 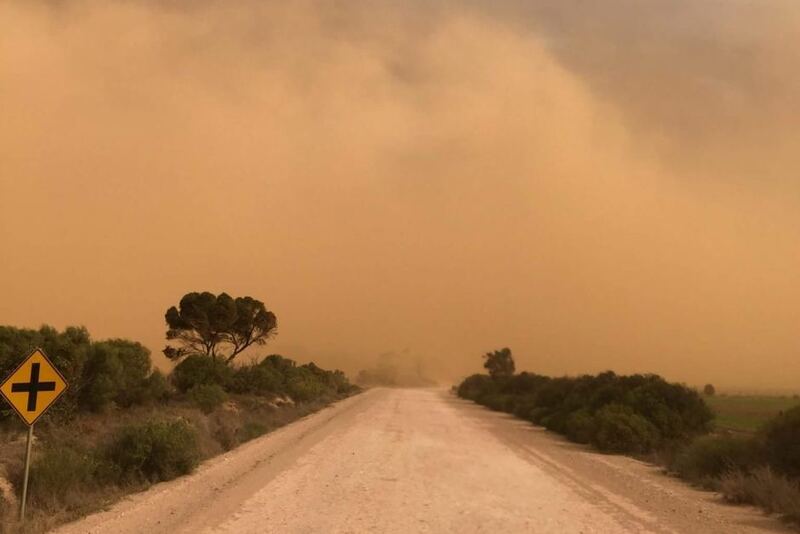 Dust Storm on the Eyre Peninsula – 250 klms long. 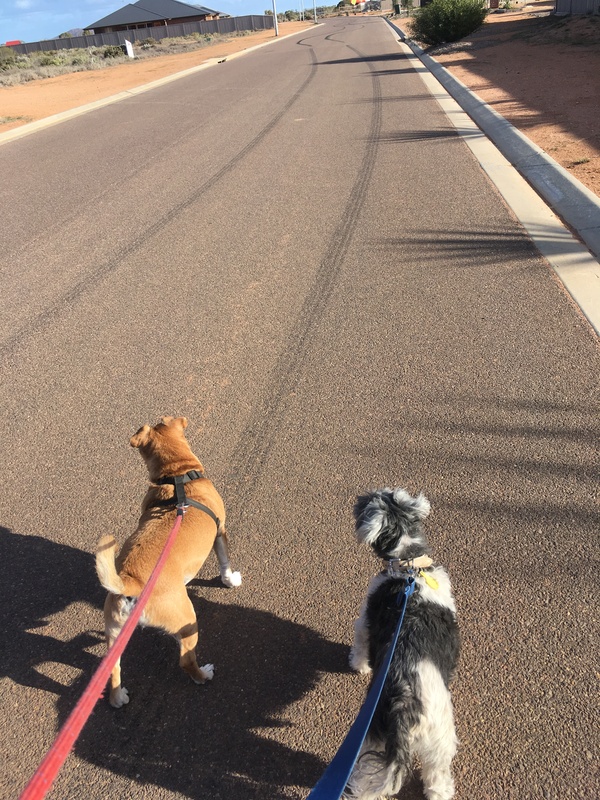 even for a short walk. Well, we did get out for our walk at 07:20. The rain had gone and the heavy wind had gone. Still a bit of a breeze – and cold with it – but the major wind had died away. A temporary respite before it started again. Finally staggered into bed at 23:30 and went out like a light. I didn’t set the alarm so it was 06:45 before I said good morning to the world. I pottered about much of the morning trying to tidy up before the forecast wind started again. I took Benji for a walk around the Wetlands. It was quiet and I was fortunate to have a chat with the manager of the new Kiosk. She said that it’s progressing but slower than she would like, but she should, all being well, open in September. Just a mere three weeks away. The wind has started up again so I’ve given up trying to clear up leaves that just keep being blown about. Ah, only 24 days until Spring. Yogi came this afternoon (Saturday) and will be here at least until next Friday. If not Annabell will have one night of looking after both as I head off to the quarterly conference. Fortunately this one is in North Adelaide, so I will only be gone overnight, plus driving down and back. I have been asked to go out to the RFDS Main base at Adelaide Airport to collect some merchandise that needs to come up here. I was going to Adelaide, so I’ll end up out there. Oh well, didn’t want to go shopping anyway. Despite what we thought the rain was not nearly enough to break the drought, and there is talk that the Goyder Line could be moving more to the south, which will have the effect of a good chunk of the state being dropped back to the “Marginal Lands”designation, which is a worry. Adelaide is being rained on and subject to strong winds. There is even talk about flooding. So very different from up here. I think that is part of the problem. It rains a fair bit in Adelaide so they really have no idea what’s like to have no rain up in the farming areas. Many Adelaide people have no idea what happens in the 85% of South Australia beyond Adelaide, which in usually the norm for country sv. city. With us it’s a bit more extreme since we have a state bigger than Texas and only really one city. At the moment it’s never ending – or at least it feel like that – snow, rain, sleat, heat I can cope with, but this continual wind is depressing. You’re right we really don’t. Can’t imagine how hard it must be when your livelihood relies on rain. I’m with you on the wind. Absolutely despise it. It makes people (especially me) very, very cranky. 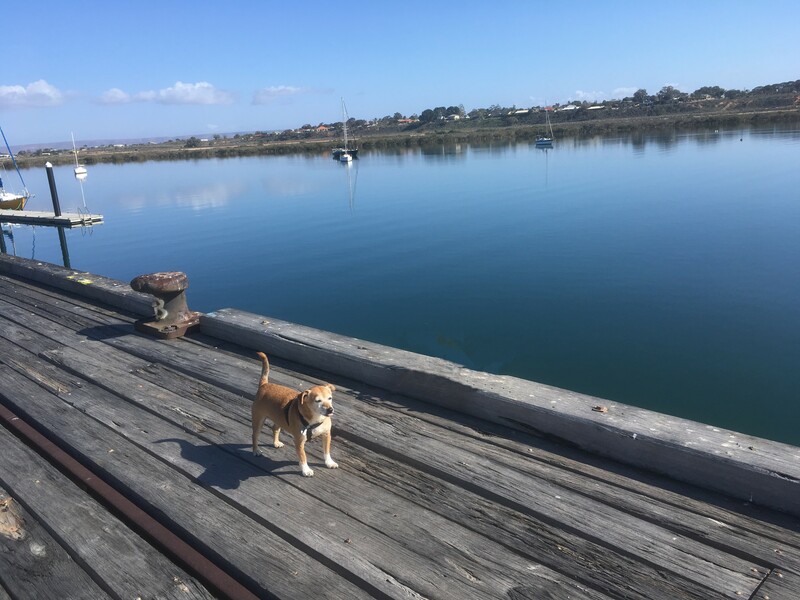 That photo of Benji on the Port is a lovely image!